Jersey's bid to become an international football nation has been rejected by Uefa's annual congress. Some 49 nations decided not to back the Channel Island's bid to become Uefa's 56th member nation. Uefa initially denied Jersey the chance to put forward a case, citing that the island is not a sovereign country as defined by the United Nations. But the island appealed to the Court of Arbitration for Sport (Cas), who ruled that Uefa must hear Jersey's case. Their case was always a long shot, with Cas stating that it did not believe the application met Uefa's membership criteria, while the English Football Association refused to back the island's bid late last year. "Jersey cannot be considered as an independent state, the Jersey FA does not satisfy the admission criteria," Uefa president Aleksander Ceferin said. "We are ready to modernise and ready to change football, but we are not above our own statutes. "This is a big change and big difference. "It would not be in line with our statutes for the Jersey FA to be admitted as a member of Uefa." Jersey is defined, along with Guernsey and the Isle of Man, as a Crown Dependency, meaning the island is part of the British Isles, but not the United Kingdom. Jersey has its own government and deals with its own internal affairs, such as setting taxes and deciding who can live in the island, but the Queen is head of state and the UK government is responsible for defence and international affairs. "We have our own parliament, own government, own laws and own taxes," said said Jersey FA president Phil Austin. "We are recognised by the OECD (Organisation for Economic Co-operation and Devleopment) as a self-governing nation. "Around 11% of the membership do not meet the requirements of article five - if necessary, can't Jersey be added to that list?" The island is recognised as a country in its own right in other sports, most notably cricket, where the island team reached the final qualifying tournament for the World Twenty20 in 2015. With a population of around 100,000, it would have been the sixth-smallest Uefa nation in terms of population, ahead of San Marino, Gibraltar, Liechtenstein, the Faroe Islands and Andorra. While neither Gibraltar nor the Faroe Islands are nations in their own right, they both applied before Uefa changed their rules in 2007 to only accept sovereign states recognised by the United Nations. Where does Jersey go from here? Jersey have long held ambitions to join Uefa, and had they tried 20 years ago, when people on the island first mooted the idea, they might well have been accepted. The island side does play in the bi-annual Island Games, although there will be no football tournament at the next games in Gibraltar in 2019 as the Uefa member does not have enough facilities. Their only pitch is surrounded by their only athletics track, meaning two sports could not be held at once. "In years gone by we would play against Gibraltar, the Faroe Islands, Bermuda and the Cayman Islands," added Austin. "Now with Fifa and Uefa commitments they no longer play us, we now have fixtures with club sides usually from the UK or France." Alternatively, they could follow nearest neighbours Guernsey, who have established a side that plays in the English non-league system - Guernsey FC are currently in the Isthmian League Division One South, the eighth tier of English football. But there are concerns on Jersey over not just the cost of flying teams to and from the island every week, but also the impact on its domestic football scene - there are 13 clubs and having their best players taken away would weaken the league. 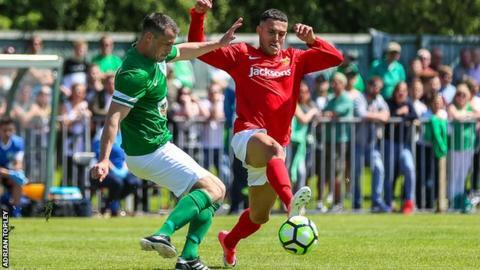 Other than the annual Muratti Vase game with Guernsey - provided they beat Alderney in a semi-final every other year - and the Island Games, Jersey has few serious games as an island side. "I had the opportunity to speak to Uefa president Aleksander Ceferin following congress and asked him how Uefa can support Jersey football, if not through membership on this occasion," added Austin. "The president has invited us to meet him and some of his team to discuss this which gives us encouragement that the door is not closed."